Every year when the weather gets warmer, rattlesnakes come out of their dens to sun themselves in Colorado and other arid states. Rattlesnakes can appear just about anywhere, but hikers on trails need to be especially vigilant. Rattlesnakes emerge from hibernation in March and April, and are most active when the temperature is between 80 and 90 degrees Fahrenheit. 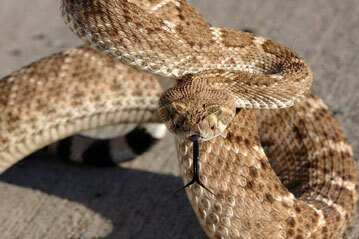 Even though rattlesnakes are not typically nocturnal, they can be active at night. Make noise when you hike. Snakes will usually withdraw if they hear someone coming. Use hiking poles to alert animals of your presence while you walk along. Stay on the hiking path if possible and be extra careful around water sources. Remember, snakes can swim. Do not walk in tall grasses. Always keep your curious dog on a leash and make sure to wear socks and hiking boots that protect your ankles. Keep your yard cut short and your window wells covered. Do not keep a woodpile in your yard or any other debris piles where snakes can hide. Talk to your vet about whether the rattlesnake vaccine would be appropriate for your dog. Make sure you get the vaccine before the start of rattlesnake season. If you hear a rattlesnake, stop immediately and assess the situation. Leave the area slowly and make no sudden moves. Each season we see curious dogs at our clinic that have been bitten by rattlesnakes, and so every year we host a Rattlesnake Avoidance Clinic in June for dogs and their owners to learn safety techniques. This event sells out every year, with the proceeds going to our nonprofit K-9 Friends. If you are an avid hiker, consider participating in a rattlesnake avoidance clinic with your dog in your area.